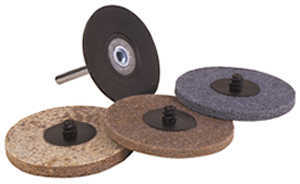 These discs work quickly on edge deburring and hard to finish corners. They deliver long life on tough burrs, sharp edges, and irregular shaped parts. They will not undercut the workpiece or leave secondary burrs. Our Type "R" holding system makes changing discs quick and easy.